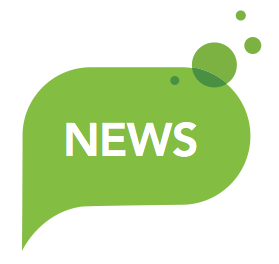 TASK is an ERASMUS + project aimed at developing a set of didactic approaches and strategies together with a web application for the assessment of Key Competences in the lower/upper secondary school in order to certificate them with national formats. TASK IS NOW IN THE DIGCOMP USER GUIDE! 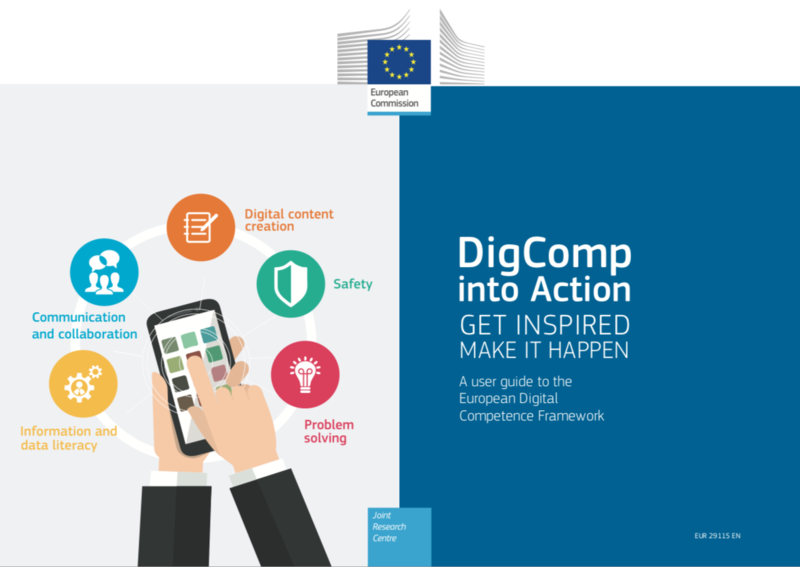 The Joint Research Centre (JRC), the European Commission’s science and knowledge service, has included TASK project in the report DigComp: Get Inspired, Make it Happen. 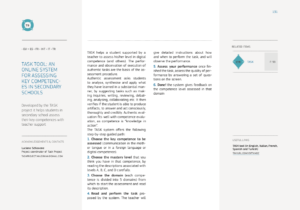 A user guide to the European Digital Competence Framework, published in May, 2018. 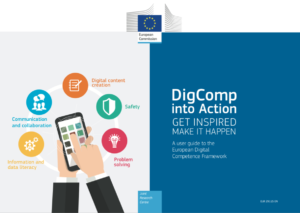 The Guide supports stakeholders in the implementation of the European Digital Competence Framework (DigComp) through sharing of 38 existing inspiring practices of DigComp implementations. These are illustrated by 50 content items consisting of Case studies and Tools: cases aim to tell a story of why and how DigComp was used, and tools are activities, methods and products developed using DigComp. 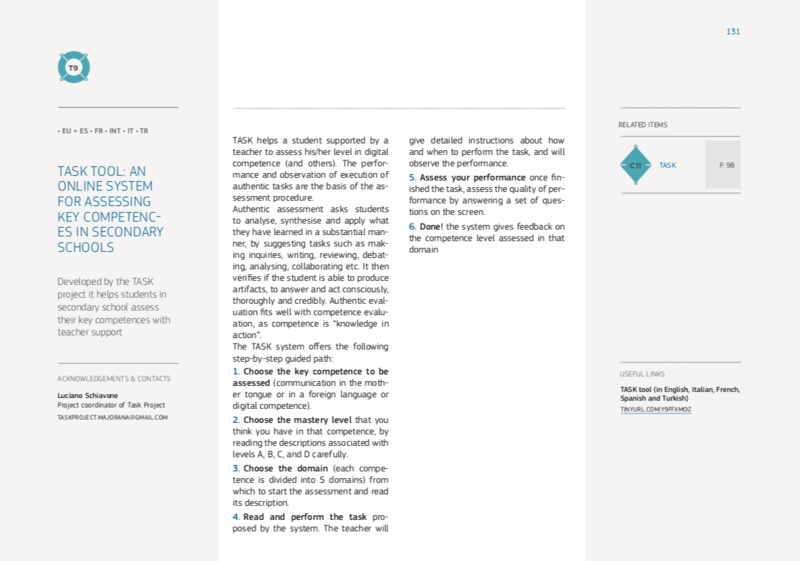 TASK is included in the Guide both as a case study and a tool, in which DigComp offered a valuable, reliable and scientific basis for the development of the assessment items. This publication recognizes the innovative scope of the project and confirms its value at European level and its consistency with the European Key Competences Framework. See the video of the Conference introduction by Salvatore Giuliano, project’s applicant school Majorana headteacher. The International Conference of TASK project (Teacher Assessment of Key Competences in School) will be held on 8 June in Brindisi. The conference, organized by IISS “E. Majorana”, project leader, will be introduced by the Headteacher Salvatore Giuliano and will be attended by institutional representatives, experts and European researchers. During the conference will be presented a procedure and an online application for Key Competences Evaluation in lower and upper secondary school, consistent with the ministerial certification templates. 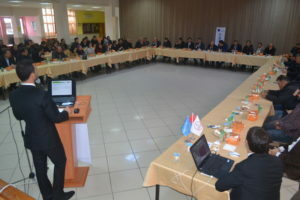 On 2nd December 2016 was held in Gümüşhane, in the seminar hall of National Directotate of Education, the first multiplier event of TASK project entitled “TASK Development: assess and certify key competences in school.” The event was organized by Merkez Atatürk Ortaokulu and was attended by 73 people,from 25 institutes; participants include teachers, provincial administrators, superintends and school managers in the province of Gümüşhane. The researchers Serdal Şeker and Oğuzhan Olgun presented the beta version of the online procedure for the assessment of Key Competences in school at ISCED2 and 3 levels; after giving some information about every stage of the project and activities carried out. 2 Aralık 2016 tarihinde, Gümüşhane Halk Eğitim Merkezi Toplantı salonunda TASK “Okulda Anahtar Yeterliliklerin Değerlendirilmesi ve Belgelendirilmesi” projesinin tanıtımına yönelik birinci yaygınlaştırma toplantısı yapıldı. Yaygınlaştırma faaliyeti Merkez Atatürk Ortaokulu tarafından organize edildi. Yaygınlaştırma faaliyetine 25 farklı okuldan 73 kişi katıldı. Yaygınlaştırma faaliyetine İl Milli Eğitim Müdürü, Müdür Yardımcıları, Teftiş kurulu başkanı, Şube Müdürleri , Okul müdürleri ve öğretmenler katıldı. Projede araştırmacı olarak görev yapan Serdal ŞEKER ve Oğuzhan OLGUN proje kapsamında bu güne kadar yapılan çalışmaları kısaca tanıttı. Ayrıca projenin Türkçe ara yüzünün tanıtımını çevrim içi uygulama yaparak tanıttı. 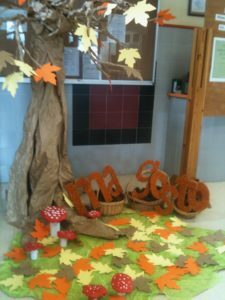 The event was organized by Learning Community with the support of ANP (National Association executives and high professionalism of the school), and was attended by 126 teachers from over 30 schools in the province of Viterbo. 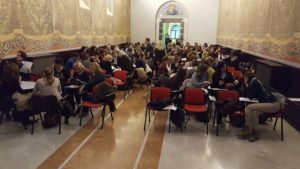 Il 24 novembre 2016 si è svolto a Viterbo, presso l’Aula Magna dell’Università della Tuscia, il secondo seminario transnazionale del progetto TASK dal titolo “TASK Development: valutare e certificare le Competenze Chiave nella scuola”. Al seminario, organizzato da Learning Community con il supporto di ANP (associazione nazionale dirigenti e alte professionalità della scuola), sono intervenuti 126 insegnanti provenienti da oltre 30 scuole della provincia di Viterbo. Le ricercatrici Eleonora Guglielman e Laura Vettraino hanno presentato la beta version della procedura online per la valutazione delle Competenze Chiave nei livelli scolastici ISCED 2 e 3; al termine della presentazione gli insegnanti, riuniti in gruppi di lavoro, hanno realizzato un’analisi SWOT individuando punti di forza e di debolezza della procedura in vista della sua applicabilità nella scuola. The 10 and 11 of November 2016 TASK force met in Vigo, hosted by the IES Ribeira, for the Third consortium meeting. 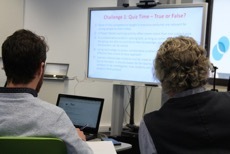 Partners focused on the piloting planning and organization, preparing for the experimentation of the TASK tool for the assessment of Key Competences in school. 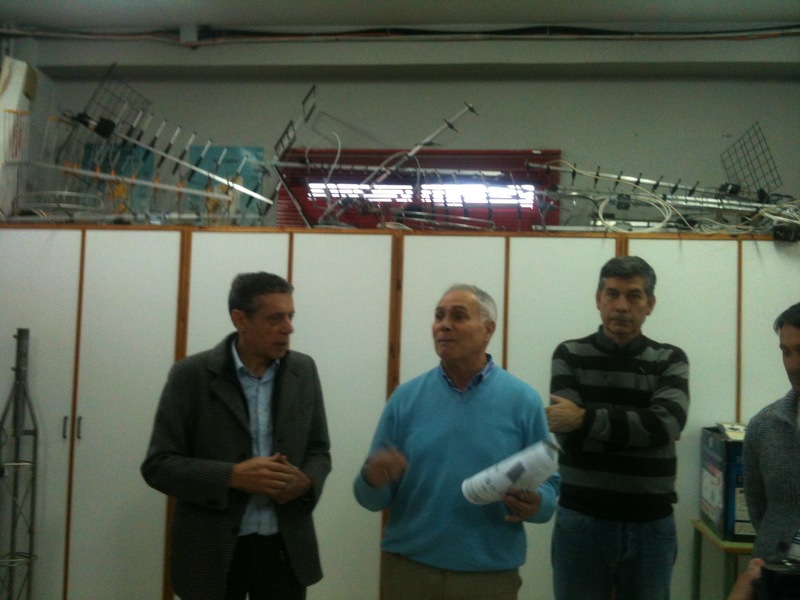 Consortium meetings yet are always a precious moment to strengthen an European culture, knowing better each other: so partners visited the school, met students and teachers of the IES Ribeira and participated also to the Magosto festival. Il 10 e 11 Novembre 2016 la TASK force si è incontrata a Vigo, ospite dell’IES Ribeira per il Terzo incontro di partenariato. I partner hanno lavorato alla pianificazione e alla organizzazione delle azioni di sperimentazione dell’applicazione TASK per la valutazione delle competenze chiave nella scuola. Gli incontri di partenariato tuttavia sono sempre anche delle preziose occasioni per rafforzare il senso di appartenenza ad una cultura unica europea, per questo è stato importante anche il momento di condivisione offerto dagli ospiti del meeting, che hanno consentito al gruppo di lavoro di visitare la scuola, incontrare insegnanti e studenti e partecipare con loro alla festa di Autunno. The TASK assessment framework is based on authentic task approach and is EUROPASS compliant. 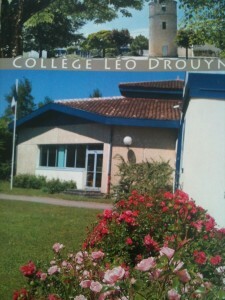 The first Piloting, carried out to test the assessment Framework, involved More than 100 teachers of lower (ISCED 2) and upper (ISCED 3) secondary school teachers in each participant partner Country IT, FR, TK, ES, BE , to verify its consistence, effectiveness, usability and coherence with the certification tools and formats in the school. The piloting report and the framework presentation are now available! La procedura di valutazione proposta da TASK si basa sull’utilizzo di compiti autentici ed è compatibile con i framework europei EUROPASS. Per verificare l’efficacia della procedura e la funzionalità del modello di valutazione, la sua usabilità e coerenza con i dispositivi di certificazione richiesti nelle Istituzioni scolastiche, sono stati coinvolti più di 100 insegnanti della scuola secondaria di primo (ISCED 2) e secondo (ISCED 3) grado dei Paesi partner del progetto IT, FR, TK, ES, BE. I risultati del piloting (versione in inglese) e la presentazione del framework metodologico (versione in italiano) sono ora disponibili! 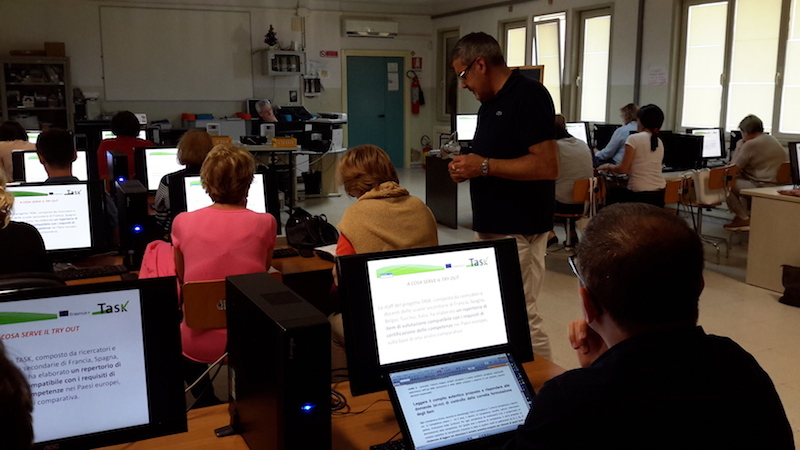 The second Multiplier event of the project TASK was held in Rome the 6 of May hosted by the “Istituto Statale per Sordi” involving about 30 participants, teachers and head teachers of the secondary schools in the province of Rome. The autoritative panel of speakers offered a rich view of the possible implications of the TASK project for the daily life in the Schools making possible a reflection on the opportunities offerd by TASK to carry out educational research, recall the legislative iter, deepen the methodological aspects of evaluation and self evaluation in the school, offer a solution towards the recent low Ordinanza n. 252 of 2016 on High school diploma requirements for 2015-16 including for the first time the Europass Certificate Supplement. Read more to have also a view of the presentations (IT version). 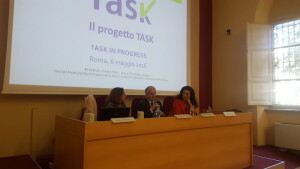 Il secondo Seminario del progetto TASK sulla valutazione e certificazione delle Competenze Chiave nella scuola si è svolto a Roma il 6 maggio presso l’Istituto Statale per Sordi; sono intervenuti circa 30 partecipanti fra docenti e dirigenti delle scuole secondarie di primo e secondo grado della provincia di Roma. L’autorevole panel di relatori ha offerto una ricca chiave di lettura dei numerosi risvolti del progetto TASK nella quotidianità della vita scolastica, circa la possibilità di condurre ricerca educativa sulla valutazione delle competenze, ripercorrere l’Iter normativo, approfondire gli aspetti metodologici della valutazione e auto valutazione nella scuola, trovare risposte operative alla recente introduzione del Supplemento Europass al diploma introdotto in Italia con l’Ordinanza n. 252 of 2016. Leggi di più per consultare anche le presentazioni commentate dai relatori. 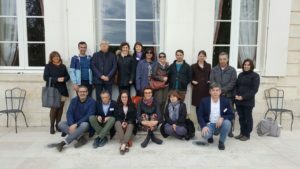 The Partners of project TASK met in Verac, in France, hosted by the College Leo Drouyn, for the second consortium meeting the 28 and 29 of April 2016. Project Partners worked on the assessment framework design and to the production of the assessment items based on real tasks. Si è svolto a Verac, in Francia, presso il College Leo Drouyn (Scuola secondaria di primo grado), il secondo Consortium meeting del Progetto TASK il 28 e 29 Aprile 2016. I partner hanno lavorato al disegno del framework di valutazione e alla generazione degli item di valutazione basati su compiti reali. Leggi di più per vedere le presentazioni illustrate nel corso del seminario. 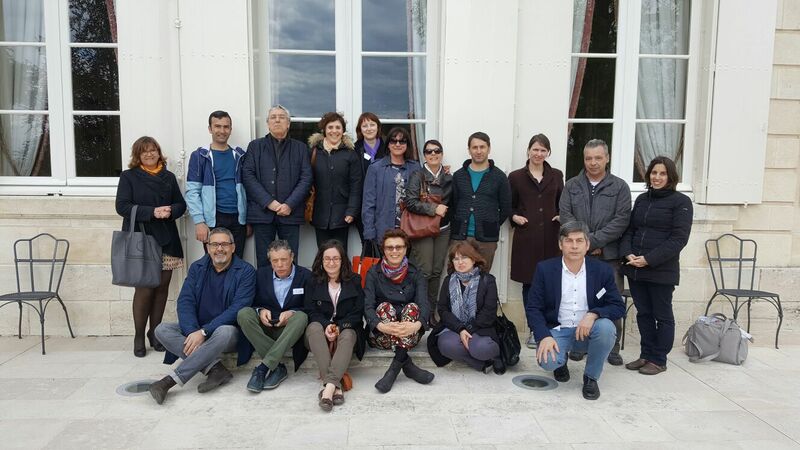 The 11 and 12 of April 2016 TASK project was presented in the the frame of Inclusive Education during the Conference of the EU policy networks: sustainable networks for inclusive education”. 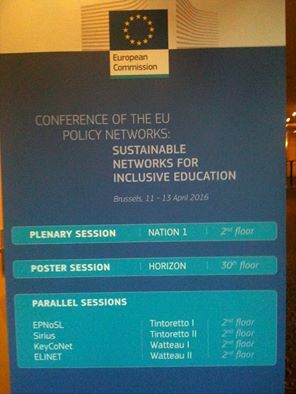 L’11 e 12 Aprile 2016 TASK viene presentato nell’ambito della Conferenza “EU policy networks: sustainable networks for inclusive education“. TASK meets Eure K (PROJECT ERASMUS+ N ° 2015-1-FR01-KA202- 015,341). 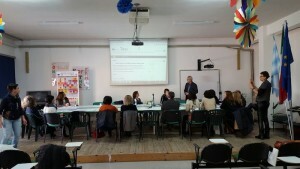 The March 18, in the headquarter of Learning Community in Rome, at once the Vocational Training and Education, the footwear district and secondary school, assessment and self-assessment meet together. The 8 Key competences and the self-assessment model designed in the VINTAGE project (ONLINE TOOL FOR SELF-EVALUATION OF KEY COMPETENCES IN ADULT AGE Project Number: 527349-LLP-1-2012-1-IT-GRUNDTVIG-GMP www.vintage.euproject.org) are the link between the two projects. TASK intends to develop a tool for the self-assessment of key competences in the secondary school, functional to the certification of Competences coming out from the educational path. As well Eure K project (2015-2018) aims in fact at the creation of a device for the validation of non-formal and informal learning, in particular, those related to key competences 5) Learning to learn, 6) Civic and social competence, 7) Spirit of initiative and entrepreneurship; 8) Cultural awareness, applied in the shoes production industry. 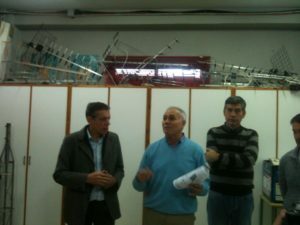 The Polytechnic of footwear (Resource Center of the Industrial District of the Riviera del Brenta Footwear) participates in the Eure K project funded by the Erasmus + program, coordinated by the CNAM (http://international.cnam.fr/valider-et-certifier-les- competences-cles-europeennes-767221.kjsp). 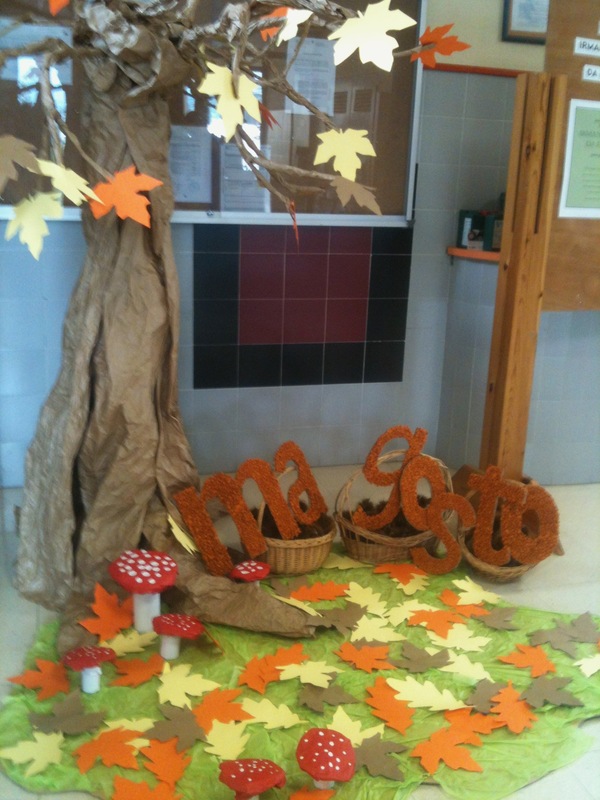 TASK incontra Eure K (PROJET ERASMUS+ N° 2015-1-FR01-KA202- 015341). Il 18 Marzo, presso la sede di Learning Community, in un colpo solo s’incontrano la Formazione professionale e l’Istruzione, il distretto calzaturiero e la scuola secondaria di primo e secondo grado, la valutazione e l’autovalutazione. TASK intende sviluppare un dispositivo per l’autovalutazione delle competenze chiave nella scuola secondaria di primo e secondo grado, funzionale alla certificazione delle competenze in uscita dal percorso di istruzione. Così il progetto Eure K (2015-2018) mira infatti alla creazione di un dispositivo di validazione degli apprendimenti non formali e informali, in particolare, quelli relativi alle competenze chiave 5) Apprendere ad apprendere, 6) Competenza civica e sociale, 7) Spirito di iniziativa e imprenditorialità, 8) Consapevolezza culturale, applicate nel settore della produzione calzaturiera. Il Politecnico della calzatura (Centro Risorse del Distretto Industriale della calzatura Riviera del Brenta) partecipa al progetto Eure K finanziato dal programma Erasmus +, con capofila il CNAM (http://international.cnam.fr/valider-et-certifier-les-competences-cles-europeennes-767221.kjsp). Are you interested in key competences and their assessment? Do you want to know more about European Schoolnet projects for teachers? TASK moves from the VINTAGE – Online tool for self eValuatIoN of key competences in adulT AGE – Reference: 527349-LLP-1-2012-1-IT-GRUNDTVIG-GMP (www.learningcom.it/vintage), an innovative european procedure and tool for the self assessment of key competences in adult age. The VINTAGE tool and procedure, after one year from the end of the project, are applied at several levels. TASK intende adattare e trasferire al settore dell’istruzione il modello di valutazione delle competenze disegnato nell’ambito del progetto VINTAGE – Online tool for self eValuatIoN of key competences in adulT AGE – Reference: 527349-LLP-1-2012-1-IT-GRUNDTVIG-GMP (www.learningcom.it/vintage), a distanza di un anno dalla sua conclusione il progetto VINTAGE si offre come esempio e pratica innovativa per l’autovalutazione delle competenze chiave degli adulti in Europa. Lo dimostra l’utilizzo che di questo modello viene fatto su diversi fronti, a titolo esemplificativo ne riportiamo alcuni. 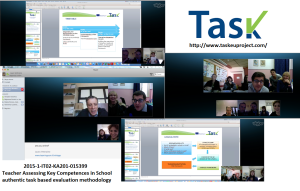 The first consortium meeting of TASK project – Teacher Assessing Key Competences in School authentic task based evaluation methodology – 2015-1-IT02-KA201-015399 was held by Skype conference on November 30. Le meeting de lancement devait se tenir à Bruxelles les 26 et 27 novembre 2015 mais suite aux attentats de Paris celui a été annulé et remplacé par une visioconférence entre les partenaires. 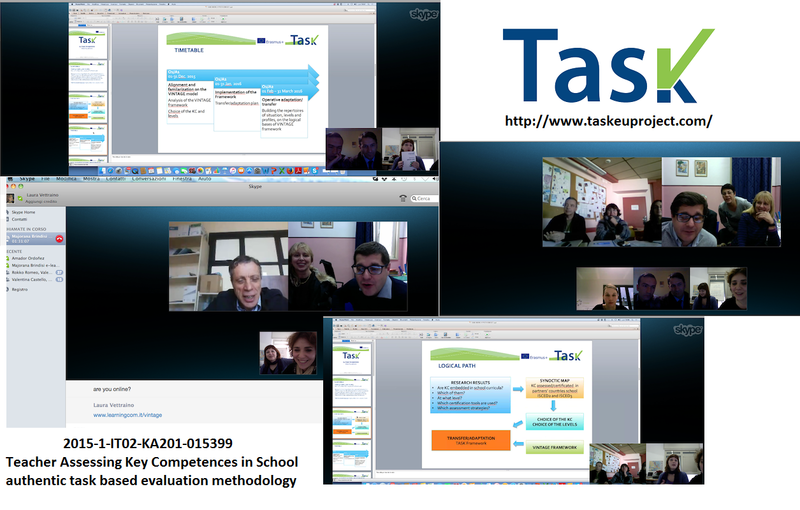 Si è svolto via Skype il primo consortium meeting del progetto TASK – Teacher Assessing Key Competences in School authentic task based evaluation methodology – 2015-1-IT02-KA201-015399 il 30 Novembre. Il meeting era programmato per il 26-27 novembre a Bruxelles, ma a causa della grave situazione di quei giorni non è stato possibile svolgere il consortium meeting a Bruxelles come prestabilito.